Garrison is a small village near Lough Melvin in County Fermanagh, Northern Ireland. The Roogagh River runs through the village. In the 2001 Census it had a population of 357 people. 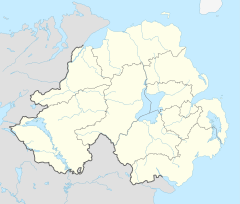 It is situated within Fermanagh and Omagh district. According to the UK Met Office, the highest temperature ever recorded in Northern Ireland is 30.8 °C (87.4 °F) at Knockarevan, Garrison on 30 June 1976. Visitors to Garrison can enjoy a wide range of activities including golfing, fishing, hill-walking, water sports, horse-riding, cycling, camping and caving. The Lough Melvin Holiday Centre caters for large groups and there are a plethora of local guesthouses and chalets to let. Two local pubs – The Melvin Bar and The Riverside Bar – provide music and craic. The local restaurant, The Bilberry, is well established and well renowned in the North-West region. Ulsterbus route 64 serves Garrison on Thursday with two journeys to Belleek and Belcoo and one journey to Letterbreen and Enniskillen. Belleek, approximately five miles away, is served by Bus Éireann route 30 every two hours each way for most of the day plus an overnight coach. This route operates to Donegal, Cavan, Dublin Airport and Dublin. Lough Melvin in Ireland is home to the Gillaroo or 'salmo stomachius', a species of trout which eats primarily snails. Gillaroo is derived from the Irish for 'red fellow' (Giolla Rua). This is due to the fish's distinctive colouring. It has a bright buttery golden colour on its flanks with bright crimson and vermillion spots. The gillaroo is characterised by deep red spots and a "gizzard", which is used to aid the digestion of hard food items such as water snails. Experiments carried out by Queens University, Belfast established that the Lough Melvin gillaroo species cannot be found anywhere else in the world. They feed almost exclusively on bottom living animals (snails, sedge fly larvae and freshwater shrimp) with the exception of late summer when they come to the surface to feed and may be caught on the dry fly. Other lakes reputed to contain the gillaroo are Lough Neagh, Lough Conn, Lough Mask and Lough Corrib. However, the unique gene found in the Lough Melvin trout has not been found in some 200 trout populations in Ireland or Britain. The sonaghan trout (Salmo nigripinnis) is another species unique to Lough Melvin. It can have a light brown or silvery hue with large, distinctive black spots. There are sometimes small, inconspicuous red spots located along its posterior region. Its fins are dark brown or black with elongated pectorals. Sonaghan are found in areas of open, deep water, where they feed on mid-water planktonic organisms. Garrison is named from a barracks erected by William III who halted here after the Battle of Aughrim. The Melvin Hotel, previously owned by the McGovern family, was blown up during the middle of a Catholic wedding reception, by the IRA reportedly as retaliation for allowing members of the security forces to stay on the premises. The Police Service of Northern Ireland came under gun attack in the town on 21 November 2009. Michael Moohan, one time minister for railways in the New Zealand Government, was born in Garrison. Patrick Treacy, author and one time physician to Michael Jackson, was born in Garrison where his parents ran a shop, garage, and filling station. He released a memoir regarding his life growing up in Garrison during the Troubles and his later financial struggles to become a doctor in a book entitled Behind the Mask: The Extraordinary Story of the Irishman who became Michael Jackson's Doctor in 2015. ^ "Lough Melvin Holiday Centre". Discovernorthernireland.com. Archived from the original on 28 September 2007. Retrieved 5 February 2014. ^ Fermanagh police officers return fire after attack, BBC News, 22 November 2009. ^ Richard Fitzpatrick (3 October 2015). "Michael Jackson's former doctor, Dr Patrick Treacey, reflects on his life so far". Irish Examiner. Retrieved 28 February 2016. ^ Rebecca Maher (9 October 2015). "Michael Jackson's Irish doctor releases memoir". Irish Examiner. Retrieved 28 February 2016. This page was last edited on 15 April 2019, at 12:56 (UTC).